A touch of Tibet awaits me once I exit the Metro station. The smell of incense is blowing through the streets. Tibetan vendours around the Lama temple complex are selling incense sticks, prayer ties, pictures of the saints and other goods. The surronding smell, the sound and the atmosphere are familiar for me since I travelled across Tibet from Lhasa till Zhangmu at the tibetan-nepalese border in August 2010. As my adventure trip starts tonight at 6 PM, which may mean being on a tight schedule from tomorrow on, a relaxed morning is exactly what I am looking for today. 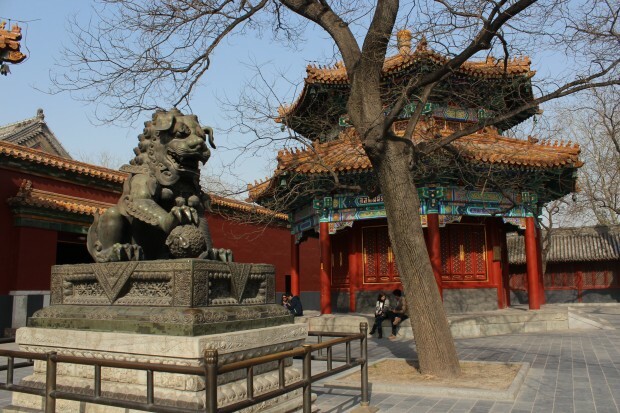 For the afternoon I have planned a visit of the Lama Temple, also known as Yonghe Gong, which is located in the northeast of Beijing. After breakfast I am using the hotel swimming pool once again before checking out of my hotel room. When having finished all formalities with the reception staff, I order a taxi to the hotel, where my group tour will start in the evening. There I can luckily check in immediately. My hotel room is surprisingly nice and comfy, a lot better than I have expected. Back down in the lobby I am informed through the notice board of the canadian adventure travel company I will be travelling with, that my tour leader will be a guy named Leon and that I will be travelling with thirteen other people. I also meet an elderly western lady there who is travelling with the same company like me but on a different tenday tour. It has started two days ago and will lead her to Xian, Yangshuo and Hongkong, three places I will also visit. She is accompanied by a young chinese female who is her tour leader. They are leaving for Xian tonight on the overnight sleeper train. Both are really nice and after chatting with each other for a while, the tour leader explains me the way to the nearest Metro Station Chongwenmen which is easy to find. To go to the Yonghe Gong, I don’t have to change trains, I only need to ride six stations till the Metro station Yonghegong. 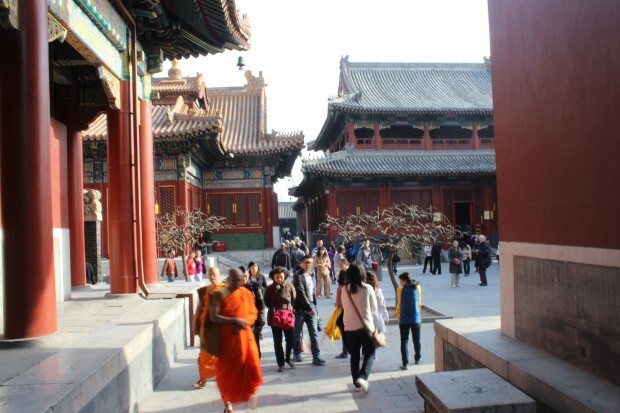 At the Archway which marks the entrance of the Yonghe Lamasery, how the Lama Temple is also called, my anticipation for the Lama Temple finishes abruptly when facing loads of tourists and package tour groups from all around the globe who are pushing into the temple complex. 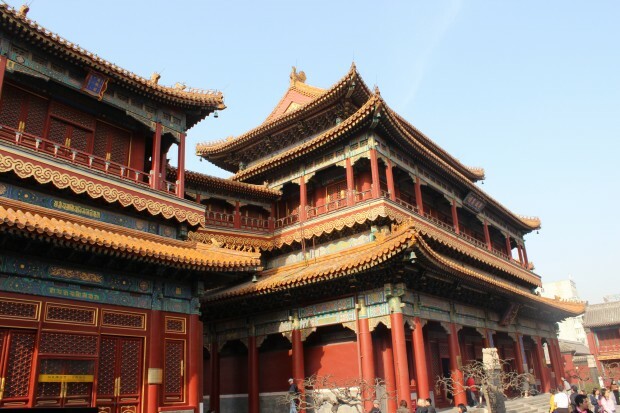 The Lama Temple was built in the 17th century and became the residence of Prince Yin Zhen till he was crowned Emperor Yong Zheng and moved to the Forbidden City in 1723. The building then got yellow roof tiles and was reserved for religious purposes. 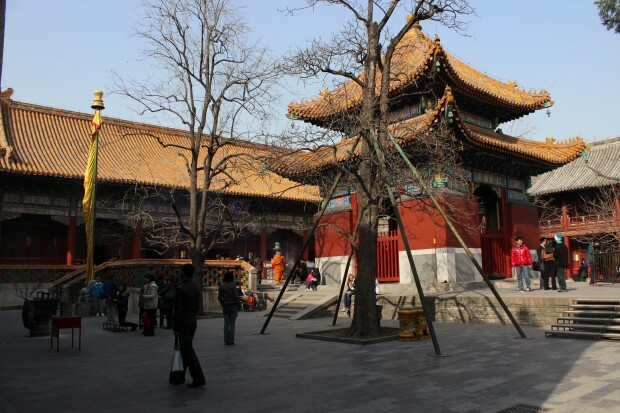 In 1744 the temple was converted into a Lama Monastery and hosted Monks from Tibet and Inner Mongolia for whom it played an important role. In 1949 it became a National Monument and as a result was closed for 30 years. Nowadays the Lama Monastery is a tibetan-buddhist center. 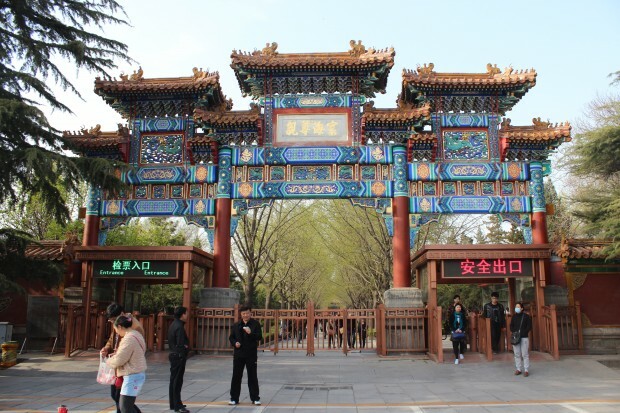 I pass the Archway, walk along the Imperial Way and cross the Zhaotai Gate. 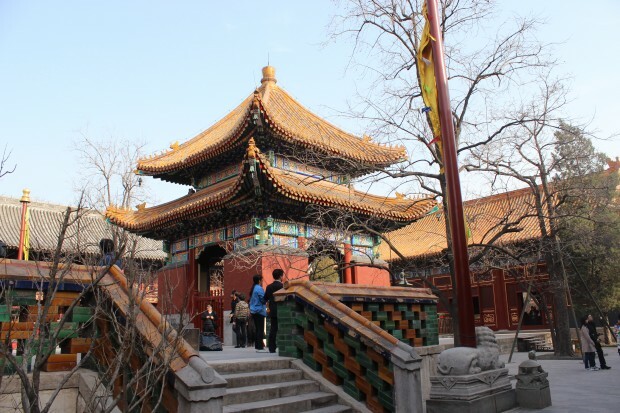 On my left lies the Drum Tower, on the right the Bell Tower of the temple complex. 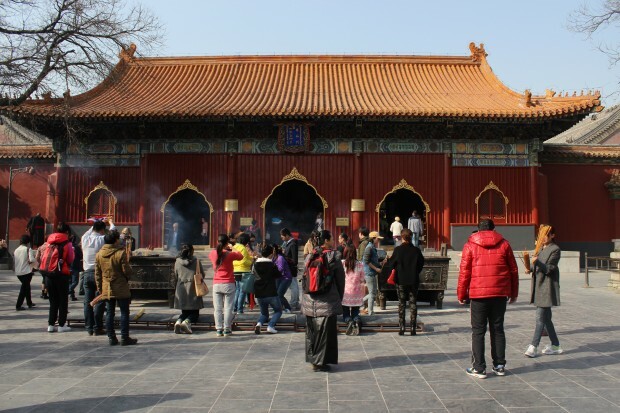 Visitors are examining a huge caldron in front of the Drum Tower and a huge Bell in front of the Bell Tower. 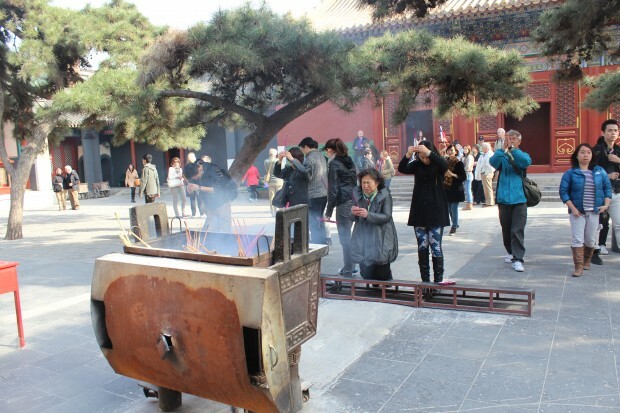 All over the complex people are bowing in front of incense-holders and offering incense sticks before sticking them into the holders. As well there are wonderful Mandalas and Sculptures. In one of the halls of the complex, believers are praying in front of a golden Buddha statue. The statues in the Hall of Yonghu (Yongyou Dian) are Nandikesvras, Buddha statues which are nowadays completely covered, as they are shown in sexual union. In the Hall of Falun (Falun Dian) I feel myself transported back to Tibet when facing the gold-plated Bronze statue of the Founder of the Yellow Cap Order. I encountered Monks of the Order of the Yellow Cap when visiting the Sakya Monastery in Tibet in August 2010. 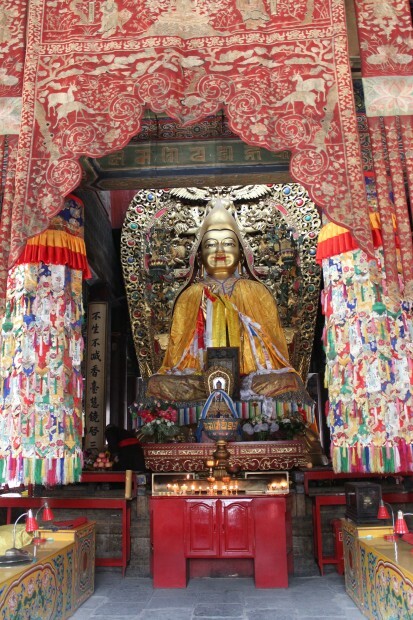 Unfortunately I don’t have enough time to visit the Ten-Thousand Buddha Pavilion (Wanfu Ge) , the last and supposed to be most gorgous hall of the temple complex, hosting a 26 metres-high Maitreya-statue which was manufactured from one single rosewood trunk. It was a present of the seventh Dalai Lama for Emperor Qianlong whose transport from Tibet to Beijing took three years. But I fear that I otherwise might be too late for my group meeting, so I am leaving the temple complex. The only downer of my visit were the hordes of disrespectful western tourists. In the Metro I am getting into conversation with a western couple who are also on their way to their inital group meeting of an Adventure tour across China but they are travelling with another company and are supposed to meet their group in another hotel. At 5.45 PM I am back in the hotel lobby where I encounter a young chinese guy who asks me if I am travelling with G Adventures what I affirm and add that I have booked a trip called Essential China. He introduces himself as Leon and lets me know that he will be my tour leader. I introduce myself as well. “Have you ever been to China before, Vanessa?” “Yes, I have been to Yunnan and Tibet on another tour.” He wants to know which places we have visited at that time and how I liked them. I let him know how much thrilled I was and that after visiting all those places I knew, that I definitely wanted to go back to China. I mention that I had planned to do our trip already in May 2010. I also meet my thirteen travel mates who are Ingrid, Bianca, Mark and Carl, a family of four, from South Africa, Vikki and David, a young couple from the UK, Alexander from Denmark, Carly from the UK, Petra, who is, like me, from Germany, but from another part of the country, Jason, originally from the UK, but now living in Northern Ireland together with his girlfriend Frances, who is also in our group, Terence, Frances’ Dad, also living in Northern Ireland, and Giorgio from Italy. In our group meeting Leon presents a map of China and points out, that on the map, China has the shape of a chicken. He explains us, that we are now at the throat of the chicken and that from here we will be travelling to its belly et cetera. 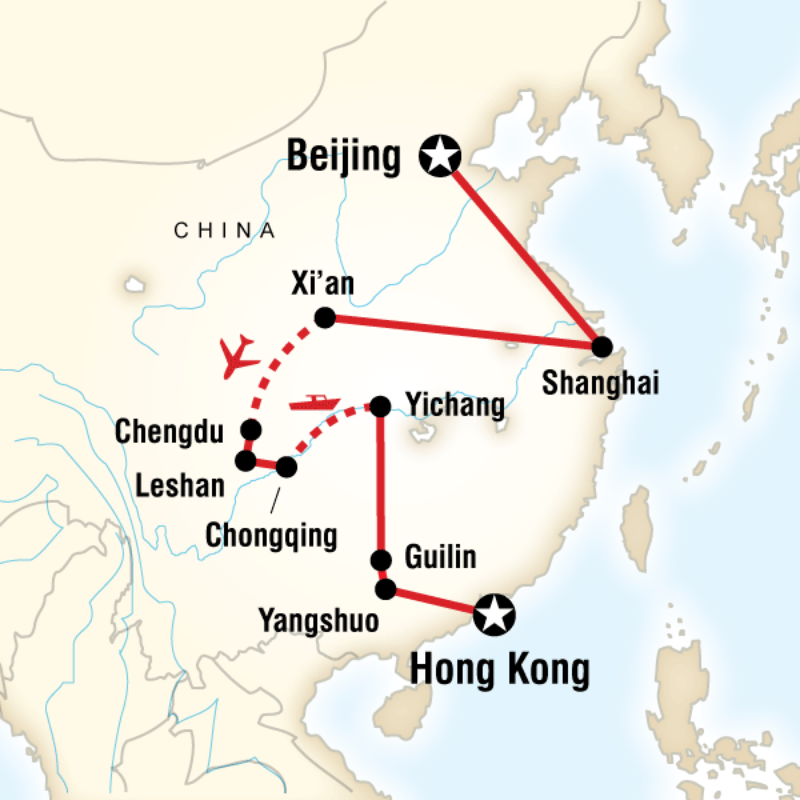 He discusses the tour itinerary with us and alludes us what we might encouter during our time in China. The Yangtze River boat, for example, could happen to be the worst accommodation on our whole tour as it has happened on one of the previous tours he has led already this year. He tells that chinese people, especially the older ones, sometimes tend to walk very slowly, but when in the train station, as soon as facing the train, start to bold. Thereby they are overtaking younger people and as soon as passing by, they start to shuffle straight in front of the younger people’s feet, again very slowly. He also alerts us off a specific type of Rickshaw cyclists who are especially waiting for tourists to rip them off or even take them to deserted places, where the tourists don’t want to go to but where they are then forced to pay a price which is totally off the roof. When we have finished our Meeting Leon takes us to a local restaurant which is supposed to serve the best Noodles in Bean Sauce in whole Beijing. On the way there I am talking with Alexander who lives fifty kilometres away from Copenhagen. 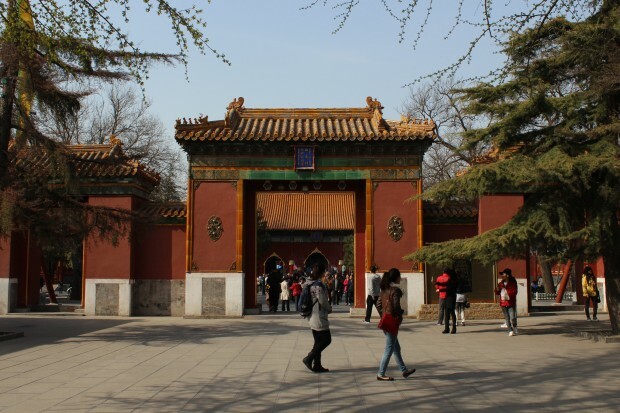 He got into Beijing yesterday and together with Giorgio, who he is sharing a room with for the next couple of days, he has visited the Temple of Heaven already as well plus the Tiananmen Square and the National Museum where I haven’t been yet. From the hotel we leave the busy Chongwenmen and walk into a more quiet street, making a few turns till we reach a very local restaurant. We are the only western guests there and accordingly people observe us with interest. Leon wants to know whether everyone wants to have a meal just by him-/herself or if we would rather like to order several dishes together and pass them around so that everyone could try everything. The group opts for sharing dishes. I am sitting next to Carl, the 17-year old son of the south african family, who tells me that he has studied chinese in school for one and a half years, but that this is already a while ago. The food is diversified, delicious and fresh plus it is very cheap. This is exactly what I have hoped for, getting the chance to try typical food in a local restaurant, having the chance to try several dishes. Fortunately the group seems to be open-minded for that. When walking back to the Hotel I am conversing with Petra, the other german, who is from Berlin, and with Leon who lives in Beijing. He tells that he has a cousin who lives in Germany, in Düsseldorf, which is only 60 kilometres away from where I live. He moved to Germany twelve years ago and became german citizen recently. I am very much looking forward to the next three weeks. Leon seems to be a really nice, committed tour leader and the people in the group appear to be very nice as well. I am sure, we will have a great time together. 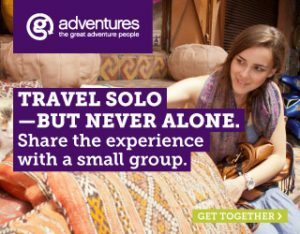 I am not getting sponsored by G Adventures but travel completely at my own expense.